This is a lovely dish and the combination of flavours works wonderfully. The roasted apples add a really nice dimension. 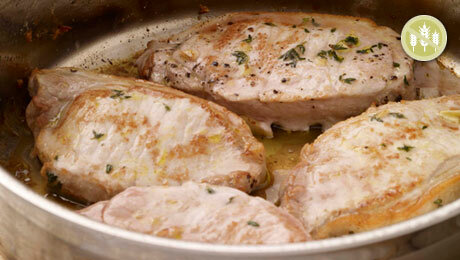 Heat a large frying pan with a little oil and quickly seal the pork chops for 3-4 minutes on either side. At this stage add in the apple quarters to the pan with the pork chops and allow them to caramelise. Place the pan with the pork and apples into the oven for 10-12 minutes to ensure the pork is well cooked through. Peel, boil and mash the potatoes with a little butter and milk. Season with salt and pepper and stir in the wholegrain mustard. Bring a large saucepan of salted water to the boil, add the shredded cabbage and cook for 3-4 minutes until it has softened, yet retains its vivid green colour. Strain the cabbage and run under ice cold water until the cabbage has cooled. Meanwhile heat a large wok with the melted butter, add the bacon pieces and cook quickly for a couple of minutes. Then add the refreshed cabbage and toss around with the bacon and the melted butter until it has thoroughly heated. To serve, spoon some of the potatoes onto the serving plate, topped with the buttered cabbage and then arrange the pork chops on top.